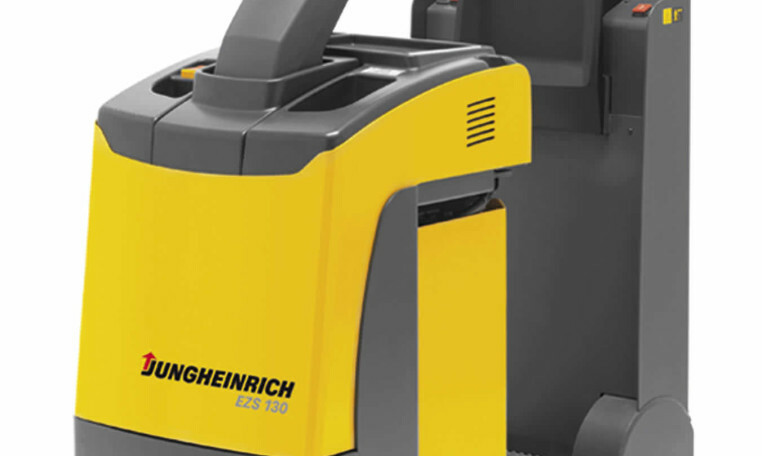 The Jungheinrich EZS 130 is a particularly compact tow tractor for pulling trailers up to 3000 kg. A narrow width of just 600 mm makes the EZS the ideal truck for particularly narrow and confined spaces. Attaching several trailers allows the loading areas to be varied. This contributes towards a flexible and economical product throughput. The coupling is visible from any position and easily accessible. The semi-automatic remote coupling release (optional) allows the coupling/releasing of trailers without the operator having to leave the platform. The EZS 130 is a particularly compact tow tractor for pulling trailers up to 3000 kg. A narrow width of just 600 mm makes the EZS the ideal truck for particularly narrow and confined spaces. Attaching several trailers allows the loading areas to be varied. This contributes towards a flexible and economical product throughput. The coupling is visible from any position and easily accessible. The semi-automatic remote coupling release (optional) allows the coupling/releasing of trailers without the operator having to leave the platform. This saves time and costs. A further advantage: The truck is available with several different couplings and can thus be adapted to any type of trailer. The 24-volt drive motor with its 3-phase AC technology ensures a high performance. The advantages: Powerful acceleration and high maximum speed. Combined with significant energy savings, extended operating times and minimised maintenance costs (due to omission of carbon brushes). This is due to the optimisation between drive motor and the electronic control, as well as the regenerative braking. The main ergonomic advantages are the low stand-on platform for frequent mounting and dismounting and the short distance from operator position to load. The EZS also operates effortlessly in confined spaces. Its turning radius is so small that the operator will feel that they are turning on the spot. The JetPilot steering wheel, supportive backrest and automatic Curve Control speed reduction as well as the load wheels with CSE tyres provide comfort and safety, especially in corners. With its narrow width of only 600 mm, the EZS is ideally suitable for narrow aisles and confined spaces. The speed set by the drive switch is maintained under all travel conditions including every travel situations including gradients / descents. 3 adjustable travel programmes for individual adjustment to set requirements. Regenerative braking with energy recovery when slowing down. Safe cornering – the operator has the truck under control at all times. Electric steering with JetPilot steering wheel. CSE load wheels for excellent travel comfort. Rear inching via buttons in the backrest on both sides.